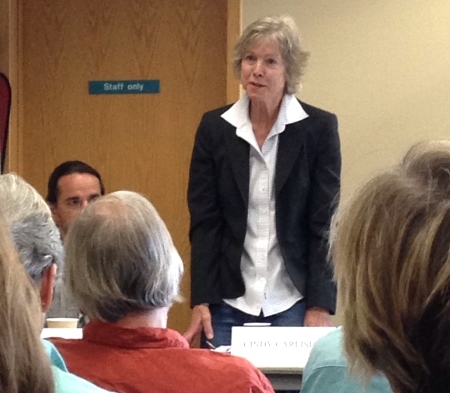 When Cindy Carlisle first served on the Boulder Council, she helped enact a “Bubble Zone” ordinance. The ordinance, which went to the U.S. Supreme Court where it was upheld, enforced a greater distance between harassing crowds and people entering health care clinics. At the time, women entering health care facilities where abortions were performed were viciously picketed by activists. Boulder’s ordinance became a model for cities nationwide, Carlisle recalls. Also during her first term on the council—a four-year term beginning in 1985—she was the chairwoman of the first Transportation Master Plan Committee, which created the Hop, Skip and Jump bus lines. And, she helped to create the first pesticide ordinance to protect Boulderites and the environment from dangerous pesticides. Three decades later, Carlisle, 70, a resident of the west Pearl neighborhood, would like to return to the City Council chambers and she is among the 17 candidates running. Carlisle became motivated to seek a seat on the council after gathering signatures for two citizen initiatives in support of the 300, the Neighborhoods’ Right to Vote charter amendment and 301, the New Development Shall Pay Its Own Way charter amendment. The initiatives would allow neighborhoods to vote on land-use regulation changes that affect their districts and block the city from approving new development that doesn’t pay for or provide additional facilities and services. Carlisle, whose father served in the U.S. Air Force, flying in the South Pacific during World War 2, moved around during her youth. She lived in places including Florida, Washington, D.C., Alabama, Virginia, Hawaii, Germany and Ohio. She fell in love with Colorado when her family was stationed in Colorado Springs. Boulder first became “home” to Carlisle in 1968, when she came to the University of Colorado determined to finish her undergraduate degree in English literature. She also earned her master’s degree from the University of Colorado. After her first term on City Council, Carlisle and her family moved to Costa Rica where they lived for a year between 1990 and 1991. Her family immersed themselves in the culture, learning Spanish. Carlisle helped edit an ecological guide, “Guia Ecologica,” which was a guide to Costa Rica’s environmental nongovernmental organizations and their missions. In 1997, she took a year-long trip abroad to learn about the International Court of Justice in The Hague, Netherlands. She and her family lived for a year without a car and relied on public transportation. “During our travels, our purpose was for study and learning about the culture that we were in,” she says. In Costa Rica, she was impacted by the warmth and generosity of the Costa Rican people, as well as their appreciation for the natural world. In the Netherlands, she became immersed in learning about laws, fairness and human justice, she says. Back in Boulder, Carlisle, a breast cancer survivor, was the first executive director of the Grillo Health Information Center in Boulder, which helps individuals with health research. Carlisle, whose political experience also includes serving a six-year term on the University of Colorado Board of Regents beginning in 2002, says that experience can help her better understand town-gown issues. Carlisle also ran for state Senate in 2008, losing in the primary election to Rollie Heath. Boulder resident Allyn Feinberg, Eco-Cycle board president and a former Boulder City Council member, has known Carlisle for nearly 30 years. She has supported Carlisle’s campaigns, dating back to when Carlisle first ran for council. “She’s always been a really strong environmentalist and huge supporter of open space programs,” Feinberg says. Feinberg says she’s impressed with how Carlisle takes strong stands on issues she finds to be important. Carlisle is a mother of two children, Dara, who is a reporter for CNet and Baine, who is a lawyer for the state of California, working on environmental and land issues. In her free time, she enjoys hiking in Mount Sanitas, spending time on the University of Colorado campus at events and the art museum and going to shows at the Boedecker Theater. She also enjoys birdwatching.